As a woman juggling commitments at work, family, social life and new adventures, I’m sure that I speak for many when we say that our “clock” just go haywire. Late nights, erratic meal times and lack of sleep make us look dull like old silver. Worse, our skin starts to exhibit this tired, yellow tinge, instead of bright, rosy undertones. I was given a Lunamer Trial Kit to address some of the signs my tired skin is starting to show. What with late-night crafting and writing, I need a quick fix before I head out to meet some people. And one star product worked wonders for me! Friends complimented that I looked more radiant. They thought that I have had more sleep. But how wrong they were! I was actually handcrafting products till wee hours in the morning. Curious what that star product is? Hop over to Beauty-Pati.com for the review. 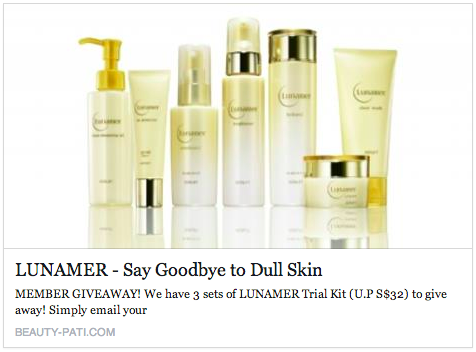 There’s also a giveaway happening now till April 13, 2014, where 3 lucky winners can get to try the products for themselves.